Middle-aged Americans are hitting the sauce too hard and too often, a new poll shows. It found that 33% of adults aged 35 to 44 who have at least one drink in a typical week agreed with one or more statements that would prompt an addiction specialist to consider treatment, according to the American Osteopathic Association (AOA). Of adults from this age group, 9% said they continue to drink even though it has already harmed their career, education and/or relationships, the online survey of nearly 2,000 people found. 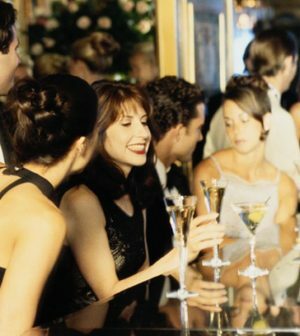 Binge-drinking — four or more drinks in a two-hour period for women and five or more for men — is typical behavior for 7% of adults aged 35 to 44 and 10% of adults aged 45 to 54, according to the poll. “We tend to believe a person is managing alcohol well if they’re not an alcoholic,” said Dr. Malissa Barbosa, an addiction medicine specialist in Orlando, Fla.
“But what many fail to recognize is the gradual impact the chemical has on the body, as well as the associated disease states,” Barbosa said in an AOA news release. Alcohol harms vital organs, increases the risk of several cancers, and has been linked with mental health problems, memory and thinking declines, and neurological conditions such as nerve pain and movement disorders, according to the association. “Our culture celebrates excess,” Barbosa said. “It’s convinced many adults that alcohol is a necessary part of their lifestyle, and that several drinks a night is normal behavior. “We worry about kids on campus who put themselves in danger, but it’s become pervasive among adults, too. It’s time for serious conversations about the impact of excessive drinking on all demographics in our society,” Barbosa said. Nine in 10 U.S. adults who drink too much alcohol are not alcoholics or alcohol-dependent, according to a federal government study. Nearly 1 in 3 adults is an excessive drinker, and most of these drinkers binge-drink, usually on multiple occasions. The U.S. National Institute on Alcohol Abuse and Alcoholism has more about alcohol and your health.